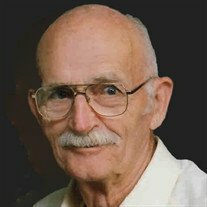 Dwight Oneal Smith, age 96, of Albia, passed away Wednesday, October 31, 2018, at the Monroe Care Center in Albia. Dwight was born on March 2, 1922, in Monroe County, Iowa to James Oneal Smith and Lottie Brown of the Blakesburg, Bunch, and Maxwell area of Monroe Co.
Dwight was one of six children, Otis, Blanche, Velda, Erma and Hazel. The family worked to help build Lake Wapello and were tenant farmers. Dwight graduated from Albia High School in 1940. On August 26, 1942, he married Delta Marie Whitlock in Albia and to this union 3 children were born, Charles, Donna, and Larry. Dwight and Delta shared 75 years of marriage prior to her passing. Dwight joined the United States Army Combat Engineers in 1943 and served his country during World War II driving trucks supplying bridge building materials. He was in France during their liberation and in Belgium during the Battle of the Bulge. Dwight returned home from his service and worked at John Deere in Ottumwa until retirement. After retiring, Dwight helped mow cemeteries in Monroe County, enjoyed traveling to visit family and army buddies, and spent leisure time refinishing antique kitchen cupboards and helping Delta with her antique shop and flea markets. Dwight was a member of the First Christian Church in Albia. His real joy in life was spending time with his family and friends. Dwight is survived by a daughter, Donna Smith of Amarillo, TX; a son, Larry D. (& Sandy) Smith of Quincy, IL; 4 grandchildren: Janis (& Jim) Johnson, Jeff (& Dawn) Smith, Julia Smith-Marzullo Reneau, and Amber Smith; 7 great grandchildren: Justin, Jamie, Jacob, Fletcher, Mitchell, Nick, and Noel; a sister in law, Ruth Sharp of Des Moines, IA; a daughter-in-law, Kay Smith of Anamosa, IA; and many nieces, nephews, cousins, and good friends. He is preceded in death by his wife, Delta Smith; a son, Charles Leon Smith; and his parents and siblings. A memorial service will be held at 11:00 a.m., Friday, November 9, 2018, at the First Christian Church in Albia with Pastor Lynda Carlson officiating. Burial will follow services at Oak View Cemetery in Albia, Iowa. The family requests that all memorials be made to the First Christian Church in Albia Iowa. To send flowers or a memorial gift to the family of Dwight Oneal Smith please visit the Tharp Funeral Home Sympathy Store.